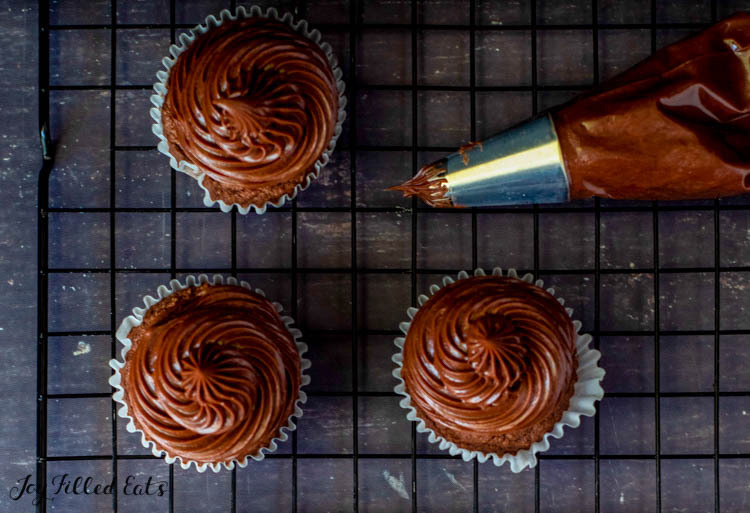 Chocolate Cream Cheese Frosting in the ultimate topping for Chocolate Cupcakes. 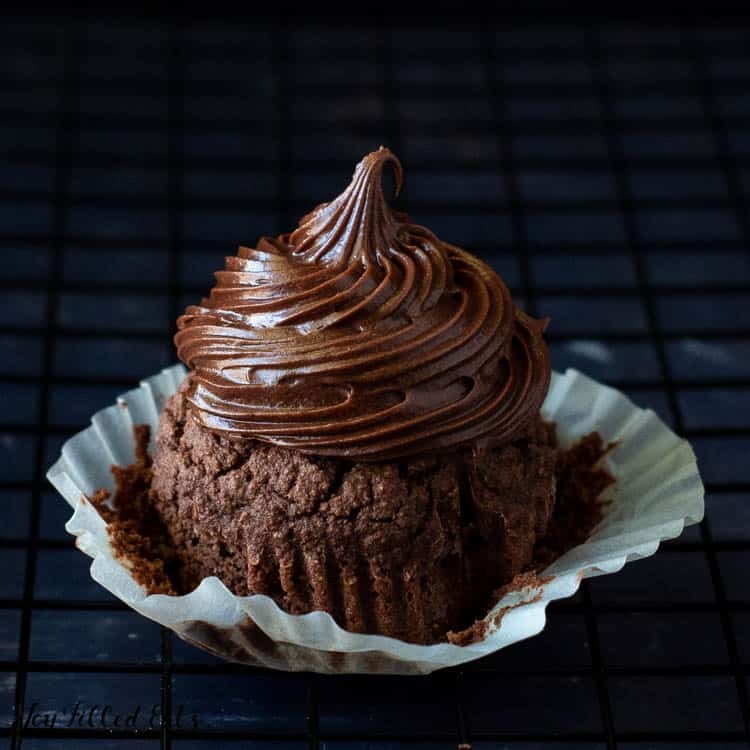 This rich and decadent icing on top of dense chocolate cupcakes will be your favorite keto dessert. Anytime I make a recipe that focuses on chocolate I have five little eager taste testers waiting to lick the mixers, the spoon, and then the bowl. These chocolate cupcakes were no exception. And the chocolate cream cheese icing was ready for even more tastes and little fingers sneaking their way into the bowl. 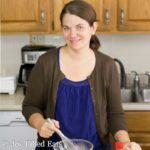 Coconut Oil – You can use either butter or Coconut Oil in this recipe – When I use coconut oil I choose to use refined coconut oil to avoid a coconut flavor. Vanilla – With the price of traditional vanilla extract continually going up I decided to try a Mexican Vanilla Extract and have been happy with the results. It is much much cheaper than other vanilla extracts and tastes the same in baked goods. 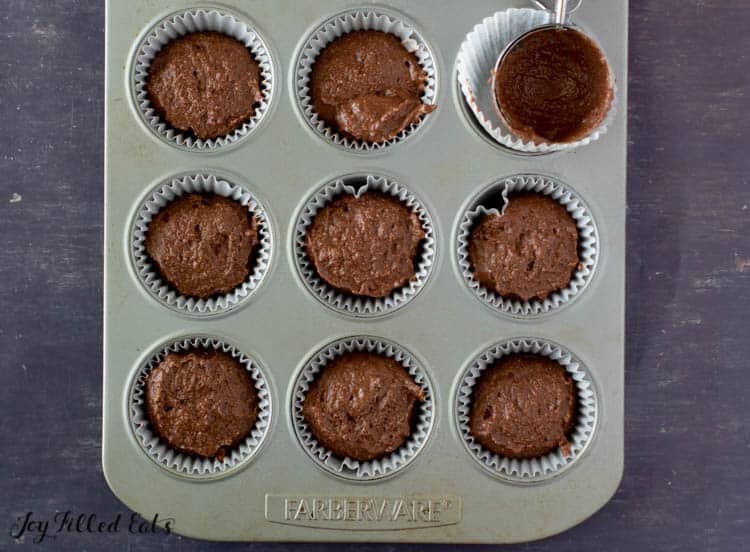 These are easy one bowl cupcakes. 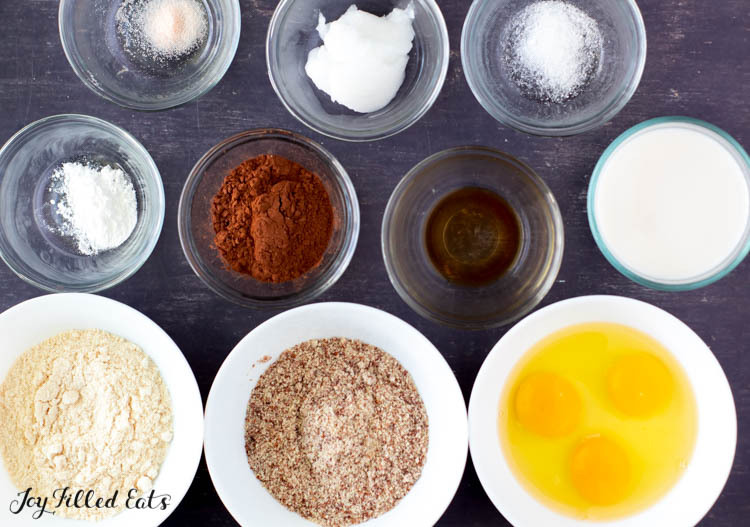 Mix the dry ingredients, add the wet ingredients, and then mix. You can mix them by hand or with an electric mixer, whichever you prefer. I love my cookie scoops. I have three different sizes and use them for everything from cookies to cupcakes to meatballs. The largest size is perfect for filling cupcakes. This helps the cupcakes bake evenly since they will all have the exact same amount of batter. When I’m baking the first thing I notice when my cupcakes are almost done is that my house smells delicious. That chocolate flavor starts to waft out of the oven. Next, the timer normally goes off. When that happens I do two2 things. The first is I gently press the center of the cupcakes to see if they spring back up. The second is I will test them with a toothpick. If it comes out clean they are done. 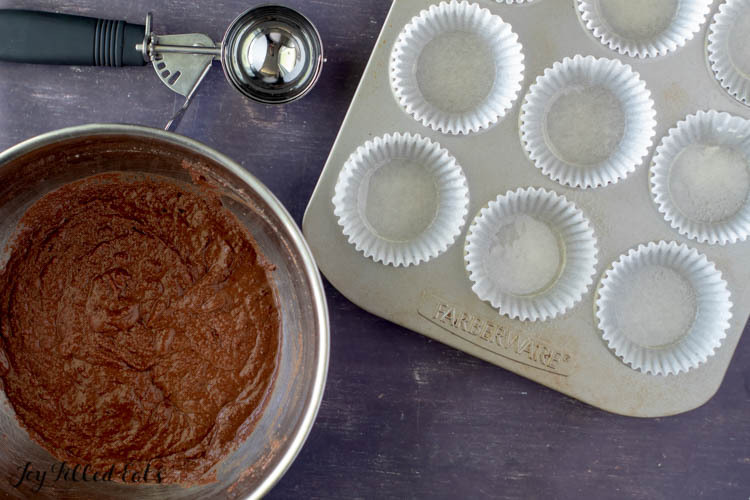 Making chocolate cream cheese frosting is just as easy as making the cupcake batter. First, you mix the butter and cream cheese. Next, you add the cocoa and powdered erythritol. Add a little vanilla and thin with almond milk if necessary. 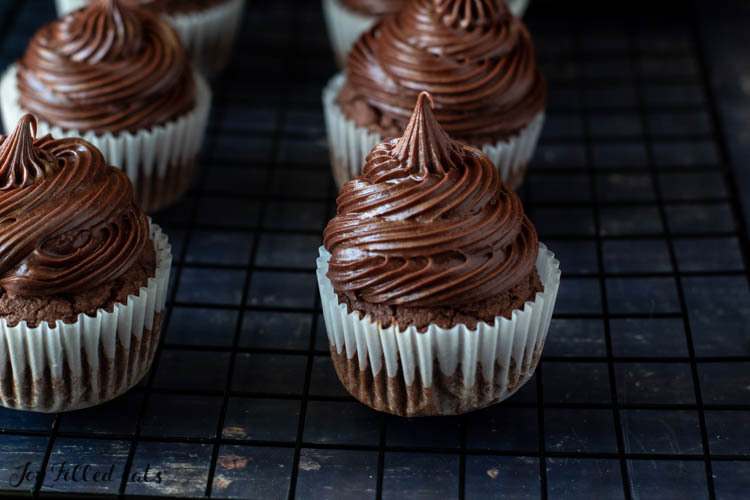 Your chocolate cream cheese icing is ready to spoon into a piping bag, spread directly on the cooled cupcakes, or just eat with a spoon. Not that I’ve ever done that. Can I use this chocolate cream cheese frosting for cake? Absolutely! For a two layer cake, you will need to double the chocolate cream cheese frosting recipe and for a three layer cake, I would triple it unless you are using a different filling. What other types of cake and cupcakes can I use this icing on? 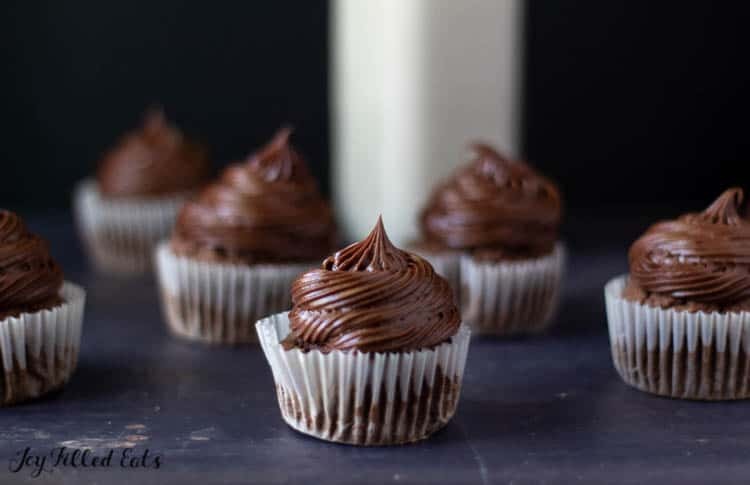 Sour Cream Vanilla Keto Cupcakes – Prefer the combination of yellow cake topped with chocolate icing? This recipe is for you. Classic Yellow Keto Birthday Cake with Chocolate Icing – You can easily sub this cream cheese icing for the chocolate buttercream on my keto birthday cake. Peanut Butter Whoopie Pies – Love chocolate and peanut butter together? 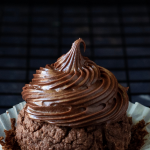 Fill my peanut butter whoopie pies with this chocolate cream cheese icing! 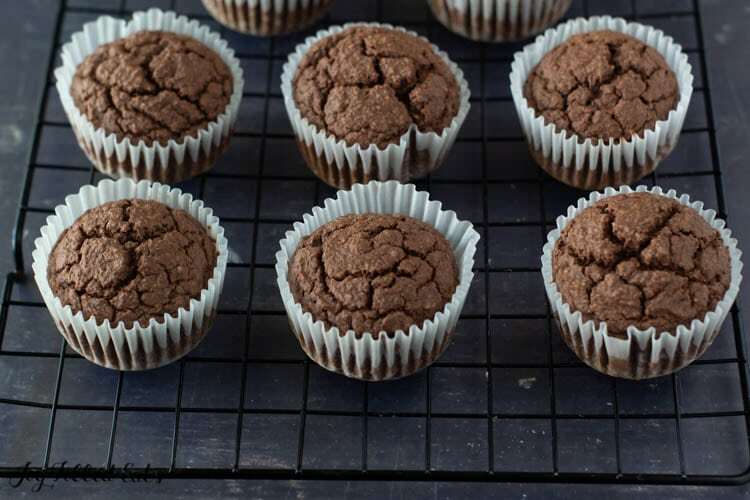 In a large bowl mix the dry ingredients - coconut flour, almond flour, cocoa powder, stevia extract, baking powder and the pinch of salt- until all the ingredients are fully incorporated. Add the eggs, unsweetened almond milk, butter, and vanilla extract. Mix for 2-3 minutes until fully incorporated. Bake for 25 minutes, stick a toothpick into the center of one cupcake to make sure cupcakes are done (they are done if it comes out clean). Remove from the oven, carefully take them out of the muffin tins, place them on a cooling rack and let them cool off for at least 15 minutes. Add the stevia, cocoa powder, vanilla extract, continue mixing until thick and creamy. Frosting should be creamy, but not runny. If the frosting it’s too dense add the tablespoons of almond milk one by one. Once you achieve the desired consistency, fill a piping bag with the frosting. Storage the cupcakes in a container with a lid. I made these last night...they are sooooo good!!!!! I brought some to share at work, and they were a HUGE HIT there, too. My hubby loves them, and this recipe is definitely going into the FAMILY FAVE FILE!!! I love a cupcake! Thanks for sharing! Love these decadent chocolate cupcakes! So good!